4.0.1 MOVING EYES & HEAD PLUS MOVING BROWS! Only a few left! Hurry! Official Groucho Marx Ventriloquist Dolls For SALE! Available in 4 doll upgrades. Grab yours today! People all over the world know who Groucho Marx is. 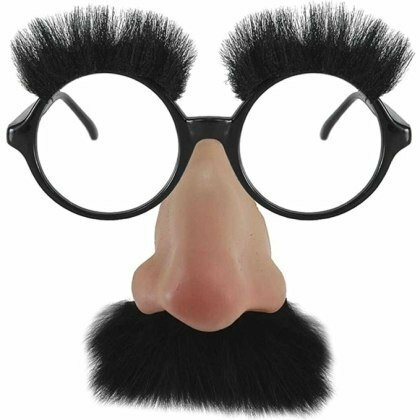 Those bushy eyebrows, dark glasses, large nose and thick moustache rock up everywhere you look around Halloween. His is easily one of the most recognisable faces in Hollywood history. The leader of the famous Marx Brothers comedy troupe, Groucho Marx made dozens of movies, stage shows, live appearances and TV specials over a space of some 50 years. Without a doubt you’ve heard his jokes and seen his skits. 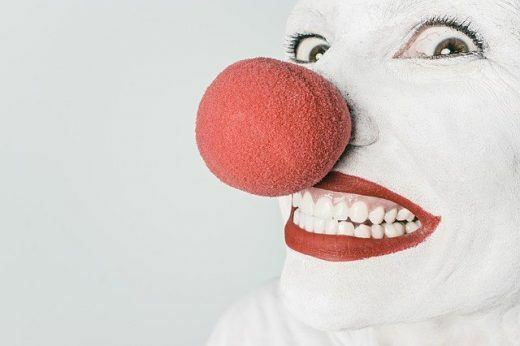 Their comedy was a clever mix of witty one-liners, word play, and all-round silliness. It’s no wonder he appealed to so many people. 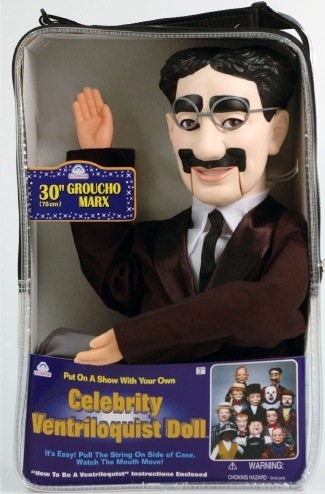 Now with the Groucho Marx doll for sale, you can keep his wise-cracking ways alive in the comfort of your own home. 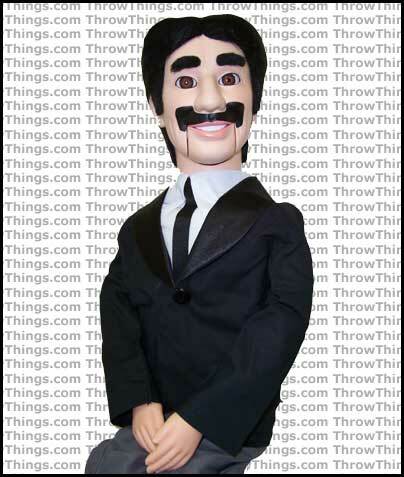 The Groucho Marx ventriloquist doll is dressed in Groucho’s trademark style. Suit and tie, grey pants, and a cigar that never leaves his side. His head is sculpted plastic with sculpted hair parted down the middle. At 30” long he’s a good size doll. He’s mostly plastic, fabric and stuffing, so he’s not terribly heavy, either. Suitable for kids, but with his small parts (the cigar, for example) he’s a choking hazard for three and under. Groucho Marx was known for his wise-cracks and one-liners, so it makes sense that he’d end up as a ventriloquist doll. The Basic Groucho Marx doll is a simple pull-string ventriloquist doll with only one point of movement, his mouth. 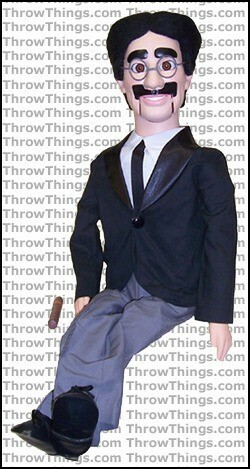 Unfortunately, as a ventriloquist dummy the Basic Groucho Marx doll he’s not the best. 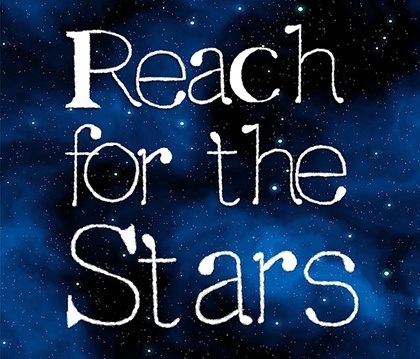 You can’t put your hand up his back and the draw string is fairly stiff. You often have to manually reposition his mouth closed after you’ve opened it because the mouth mechanism is so stiff. Obviously this is less than ideal for trying to make it a proper ventriloquist dummy. 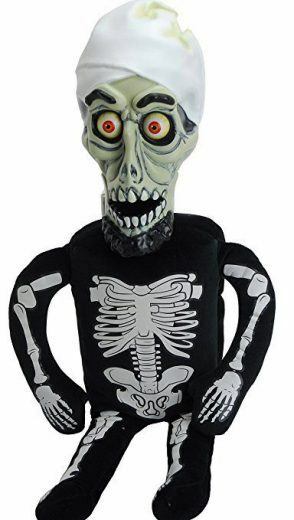 For young kids, maybe 5-8 years, this would be okay because they can still use him as a doll. For any amateur or someone who seriously wants to get into ventriloquism, should choose the deluxe or super deluxe doll upgrade versions! That being said, the Groucho Marx ventriloquist dummy does make a very nice display piece. He’s pretty big, but he’s also light. He’ll sit on a table, stool, or even a bookshelf without breaking anything. As he’s made of plastic and stuffing he won’t hurt anyone, or himself, if he falls. The Basic Groucho Marx dummy comes with a tote bag to carry him in and a beginner’s guide to ventriloquism. We don’t know how much you’ll need the ventriloquism guide, but the bag will come in handy for storage and transportation. So to recap, if you’re after some nostalgia and want a little bit of Groucho in your life, the Groucho Marx ventriloquist doll is a fine display piece to sit around your house. He’s well dressed and they did a really good job on his face.